But Straits Times report that "it's not as bad as it looks". 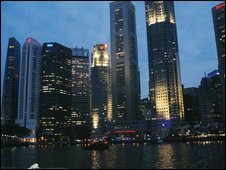 Singapore’s economy shrank by 19.7% in the first quarter of 2009 compared with the previous three months, its biggest quarterly contraction on record. Official estimates also showed the economy had shrunk by 11.5% compared with the same period a year ago. The government now expects the country’s GDP to contract by between 6% and 9% this year, much more than the previous estimate of between 2% and 5%. Singapore has been hit by a fall in exports during the economic downturn. The country’s Ministry of Trade and Industry (MTI) said the economy’s performance was much worse than expected. “MTI’s earlier forecast had factored in the likelihood of a weak first quarter, but the advance estimates indicate that actual GDP growth will undershoot earlier expectations by a significant margin,” it said. Manufacturing output fell by 29% in the first three months of the year, compared with the same period last year, pulled down by sharp falls in exports, which fell by an estimated 17% in March. And the prospects for any quick recovery appear slim. “With most of Singapore’s key trading partners still in recession, the manufacturing sector will remain weak for the rest of the year,” the ministry said. Earlier this year, Singapore announced a $13bn (£8.6bn) stimulus package to try to boost economic activity. Read also: Singapore devalues its fading dollar by The Telegraph. 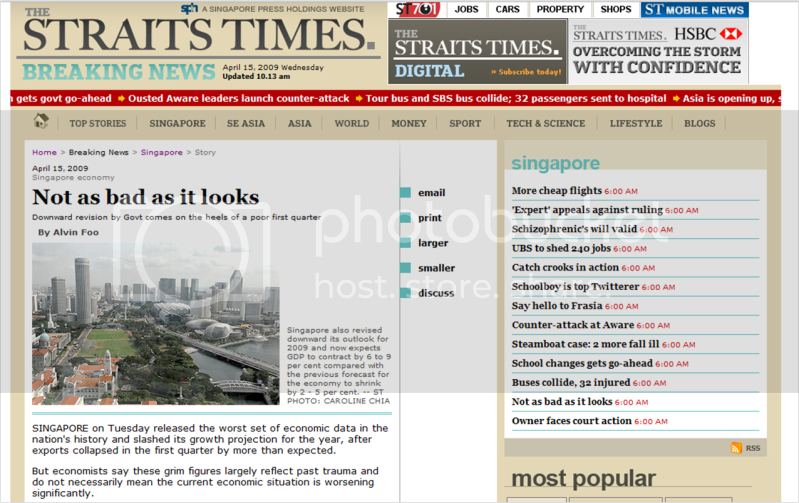 And: Singapore suffers record contraction by The Financial Times. The Straits Times: Not as bad as it looks.